Travels with my large format camera, and sometimes a digital one. This is me rationalising my thoughts by putting them into words, about why I choose to lug a big and heavy camera around the landscape only to shoot nothing at all or take up to 2 hours exposing one single negative of Black and White film. Honestly, I do wonder why I do it myself, digital is a lot easier. It is also my journey of discovery about how images work, why we are drawn to some and not to others, and my attempts at producing my own *worthwhile* images rather than a discussion of the technical intricacies of how cameras work. If you find this page enjoy it and take away with you as much or little as you desire. It is not an attempt to define photography for a generation but for myself only. Archive page 2 - Ceann Tragh Diction, Composition - Do you see what I see? All five images I took on my few days away are combined in one post here good and bad, mainly because they only seem to hold any meaning when together and against a narrative. I see a lot of comment on forums about the exact nature of light and the physics of camera technology and I can’t help but notice that it seems to lead people into incorrect and misleading assumptions. That the physical reality of an object is completely contained within the light it reflects and that the eye is a calibrated scientific measuring device that is capable of detecting that absolute light and discerning the absolute nature of the objects from it. But if this were true then how can an artist describe an object and how he feels about it with a few abstract lines on a sheet of paper? The truth is that there is no absolute reality and we do not see the light reflected in an absolute clarity. What we do is see a confusion of light and through memory and experience learn to interpret and recognise. The meaning of a banana for instance is not contained within the light it reflects but our experience and memory of having eaten them before. And because our recognition is from our own experience the banana also conjures our memory of it’s texture from touch, it’s smell, it’s taste, and the emotions we felt when we had a significant encounter with one. This is true in photography as well, it is not an exercise in capturing the absolute nature of the light reflected but a representational pattern of light that resonates with the viewer’s memory and experience and so also taps into the emotions they associate with those experiences. It doesn’t exist in the light an object reflects. On a trip to Angus to collect one of Sandra’s internet purchases I decided to spend a few days in the Angus Glens with one of mine. But it was dark and wet with sleet and snow, though stunning visually it was also that light which gives dark foregrounds with little contrast against leaden skies that render far too light to be representative. So I took a tour of some small churches along the way that resonated with my youth and impressions of a once remote community. A lovely little church full of promise, but alas that I found to be locked. Cold and impenetrable from the outside, put away until needed, with a vase that remains empty except on occasions when a use is found and the doors once again opened. A noticeable contrast in that the church was open and the vase always full of flowers. Without recognition of the day of the week it remained in character and so the same memories you felt when you entered the doors on a Sunday were still present and unchanged on a Wednesday. 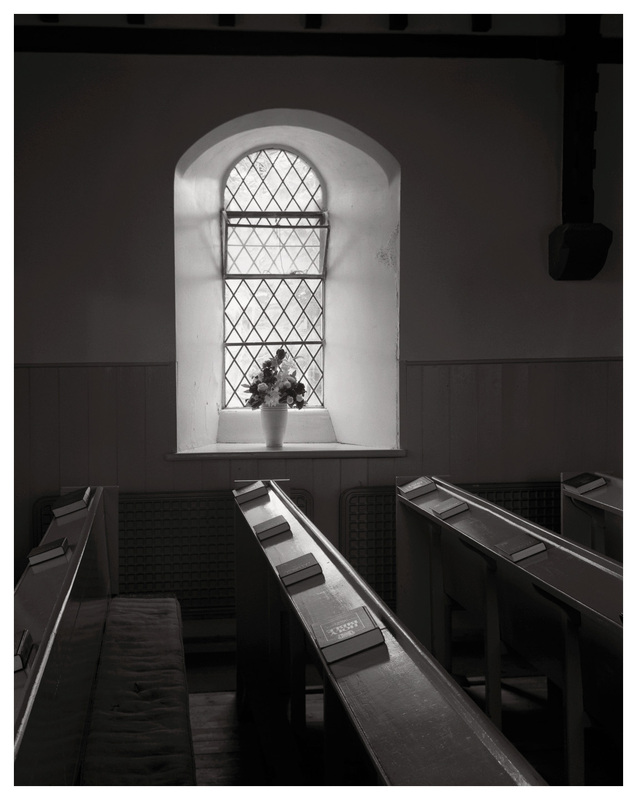 I remembered as a youngster being dragged to the almost oppressive formality of a Sunday Service where I have to admit that my thoughts and attention were seldom in the direction of the pulpit. This is a far smaller and once more remote community at the end of the road up the Glen, the church decommissioned though maintained by donations remains open and preserved. This was like walking through a door in time, a feeling enhanced by the apparent contradiction that greeted you. The door propped in open invitation seemed to have admitted only the leaves from the random motion of the wind which enhanced it’s remoteness. There was a definite feeling of oppression contained in it’s small size and lack of comfort that sat alongside one of the most unique preservations of a remote community church I’ve encountered. A large cast iron open grate sits in the middle and a delicate gas lamp with its cantilever and chains still hangs over the narrow pulpit that looms so far above the congregation as to raise the occupant aloft spiritually as well. With the Bible open to the Prophecies of Agur I was almost looking for the indent in the top right that signified the pounding of a minister’s finger separating the righteous from the sinners. It reminded me of the penitent man for only he could fit into the back rows of the gallery, so close were they to the ceiling. On a technical note, the first three images were shot with my 1910 Zeiss Tessar (17.5cm f7.7). This is uncoated and has an overall level of flare that sits just below the threshold exposure of FP4. It effectively acts as like pre-exposing the film making it quite sensitive in the shadows. It results in quite soft shadows which hold a lot of detail but generally require “printing down” on one grade higher of paper. Of course as I scan and print digitally this is approximated in the processing. The last two images were shot with my single coated Super Angulon 90mm f8 that dates from the 1960’s. All images were shot on HP5 and developed in HC110 at 1+63 after a minute pre-soak. I know Ilford don’t recommend a pre-soak but I find that it decreases bubbles and uneven development, the 1+63 dilution is a must as with HC110 I have found the development too short at 1+31. The third image was actually quite a small DR, bar the specular highlights registering just 4 stops between shadow and highlights. The negative is correspondingly flat even though developed at “N+1”. The view from the pulpit was probably the most problematic as it was very dark inside the church on that day, too dark to focus at f8 even with a dark adapted eye under the cloth, (not that cloth…). What I found I had to do was to place my reading glasses on the Bible to give a line of contrast then use the torch in my mobile to provide some illumination so I could see it. My Pentax spotmeter didn’t even move off the stop for the deep shadows and measured EV4.5 for the pages of the Bible and EV5 for the white wall on the right. The window at the top however was registering EV10. Placing EV1 on zone 1 indicated most of the tones below mid-grey and an exposure of 15sec at f32 which with reciprocity failure indicated a true exposure of 1min. The differential effects of reciprocity pushed the highlights to a zone 12, (there being no slowing of the reaction with the highlights just a straight two stop increase in exposure). Development of around N+1 was indicated as the main subject was the church and not the window at the back. I used a “stand” development of 10sec initial agitation then 10sec every 90 seconds to 6min, then at 9min and left to stand until 14min to try and gain a little compensating effect. I shot two plates of each so I could adjust development for the second shot if needed. A bit of burning was required on the Bible but no dodging around the window on the scan. I used curves with an inverse of the highlights luminosity map to stretch the shadow contrast and one with the highlights luminosity map to soften the highlights to match. The last image that had the same exposure, though not quite the same range to the highlights, also got the same treatment.